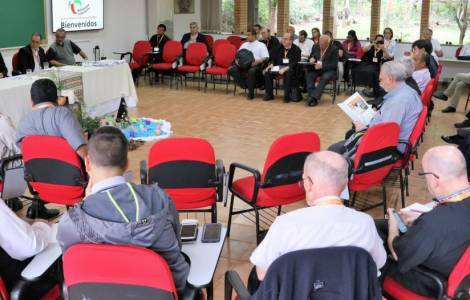 Brasilia (Agenzia Fides) - The "missionary conversion" of the whole Church requested by Pope Francis was the theme of the Assembly of National Directors of the Pontifical Mission Societies of the American continent, which took place from 18 to 23 February in Brasilia. The National Directors of 23 nations, 15 Bishops and 2 delegates of CELAM, in addition to the Secretary General of the Pontifical Missionary Union, Fr. Fabrizio Meroni, PIME, deepened the mission of the PMS in the Church today and the preparation of the Extraordinary Missionary Month in October. The event took place in the wake of the 5th American Missionary Congress (CAM 5) of Santa Cruz de la Sierra (see Fides, from 11 to 17 July 2018) of which the conclusions were prepared, now ready for publication. Fr. Maurício Da Silva Jardim, Director of the PMS of the host country, told Agenzia Fides that elements emerged from the meeting to be further explored, because "the mission ad gentes must now be deepened in its evolution, now it is no longer just territorial". The meditation of the apostolic letter Maximum illud with which exactly a century ago Pope Benedict XV wished to give new impetus to the missionary responsibility to proclaim the Gospel "has helped us to understand how to understand the mission ad gentes, which must be concretized in this globalized world on the basis of a missionary conversion and through a local ordinary pastoral care for which this conversion is necessary". Reading the final document of CAM 5 in this context again, the Director of the PMS said he was "struck" by the proposals for the missionary conversion of the Church in America. In particular, he mentions two. The first: Going forth to the peripheries of the world to meet "the others", promoting "spaces of dialogue and joy in our communities", going to the "suburbs of pain, marginalization and poverty", creating "means, methods and tools in order to meet those who have strayed from faith", and meet "the cultures, and cultural diversity of our peoples". The second proposal: "Strengthening a more ministerial and secular missionary Church", fixing the gaze on Christ and the needy, disoriented and non-believer brothers, strengthening "the great responsibility of witness and missionary of the laity oriented by the joy of the Gospel at the service of others", seriously "planning forms of secular leadership in the ecclesial community with the corresponding responsibilities, functions and authority, recognizing their service to evangelization".